STORRS - Crystal Dangerfield and Asia Durr were teammates on the 2013 United States U-16 national team. 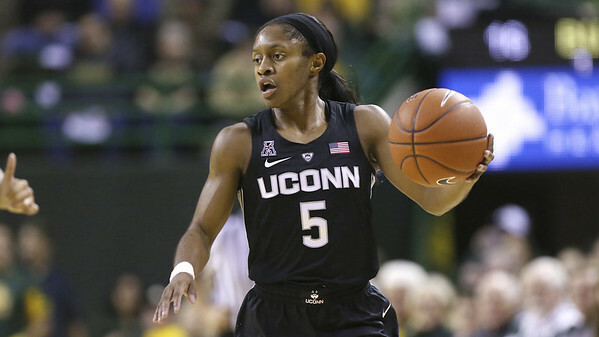 “That long ago?” the UConn women’s basketball team’s 20-year-old point guard said Tuesday. Dangerfield will renew acquaintances with her former USA teammate Thursday when the second-ranked Huskies visit Durr and No. 3 Louisville at the KFC Yum! Center. Durr was the MVP of the 2013 FIBA Americas U-16 Championships while Katie Lou Samuelson was a USA record 8-for-8 from 3-point land in the gold-medal game win over Canada. Dangerfield started two of the Americans’ five games in the event. Six years later, Durr is the reigning Atlantic Coast Conference Player of the Year and on her way to All-America honors for the second straight season. In last year’s matchup at Gampel Pavilion, Kia Nurse held Durr scoreless in the opening quarter as UConn built a 20-point lead en route to a 69-58 victory. Who will get that assignment Thursday? Durr leads the Cardinals in scoring at 21.1 points per game on 45.8 percent shooting. She takes almost half of her shots from 3-point land but also leads Louisville in free throws attempted 89. For UConn to win, it needs Dangerfield on the floor and not in foul trouble. Dangerfield comes in averaging 12.9 points and leading the American Athletic Conference in assists (5.7) and assist-to-turnover ratio (3.1). In her last six games covering 196 minutes, she has 44 assists and just five turnovers. Against Central Florida on Sunday, she had 17 points with nine assists and no turnovers in 35 minutes. “She’s been the person who holds us all together,” Samuelson said. But facing Durr, she’ll be on her own. Napheesa Collier needs two rebounds to become the eighth UConn player with 1,000. She has gotten at least two rebounds in 96 consecutive games dating back to when she got one in the 2016 NCAA Sweet 16 win over Mississippi State. “It’s not something I ever really thought about, to be honest,” Collier said. Collier also enters Thursday’s game with 1,963 points. The members of the Huskies’ 2,000/1,000 club are Maya Moore, Breanna Stewart, Tina Charles, and Lobo. Posted in Newington Town Crier, UConn on Wednesday, 30 January 2019 19:22. Updated: Wednesday, 30 January 2019 20:37.